Notice how his head is placed inside the jaws of the great white ape that is apparently eating him. I assume that's why he's down to just two toes on each foot, both of which are much larger for some reason than they would ordinarily be. Orcine digestive juices differ from primates', however, as you can see by the fact that Orka's toes have been completely flattened instead of merged into two separate giants. Now look, I can dig on Man-Ape's crazy jungle-vine boots because, hey, apes live in the jungle and you want to go with a motif. I feel ya. I don't understand why he's being eaten, but hey, I'm a live-and-let-live kind of guy, and if that's what scratches his crazy hybrid itch, then I say go for it, brother. Half-brother. Whichever. But Orka confuses me. Why is the killer whale caught mid-snack in the middle of eating Orka blue and white instead of black and white, as in nature? Maybe the giant whale-teeth jammed into his face somehow distorted his color-sense, I don't know, but it's a weird choice. Seriously, doing human-animal hybrid characters is tough, I get that. And I imagine representing this in costume as one-is-eating-the-other has a better shot at passing the censors than one-is-breeding-with-the-other, but still -- fangs in the face? That's both bad costume design and bad table manners at the same time. 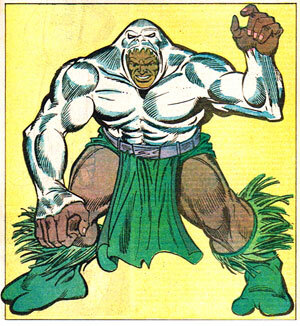 Orka and Man-Ape are © Marvel Comics; images are from "The Official Handbook of the Marvel Universe", Volume 2, Number 9, 1985. Well, on the note of Orka, there’s something to consider; Many times in comics, they use dark blue instead of black, because black reeeally limits your shading options, and blends together with your linework. You can see the same thing in quite a few comics based off of animated media, such as the Transformers comics, where characters would get +navy blue schemes instead of +black schemes. That is very true. Luckily my powers of mockery are impervious to assault by this petty thing you call “reality”. I don’t find those costumes particulary bad. I enjoy animal themed headgears. This two are oversized but they are less bad than Razorback boar helmet. The Razorback helmet is probably the worst costume of all comics history in equal with the Frogman costume (but the Frogman costume is very funny). I enjoy headgears like cobra helmet of Seth or serpent helmets of Cotonmouth or Puff Adder. I want to see animal helmets in HM 3 (serpent, cobra, but also wolf, sabertooth cat,bear, tyranosaurus or bird (eagle, raven, owl and toucan ). You have yet created a lion helmet in fantasy headgear slot.s one. I have bas taste. (:-) but i assume. I have to comment, why is one comment being posted each year on this?